IconThursday is sort of back although I know today's wasn't in the usual format. I just wanted to kick of the year with one of my own icons. And today no one feels more fitting than Mr Kenneth Dalglish. First up this is not a post calling for Dalglish to replace Hodgson, as much as I would like that. Why do I think that in the short term, at least, that would be a good idea? That's another post for another day. But I do hold him in incredibly high regard, the man is, quite simply, a legend. I came to football late as a spectacle, not really getting the supporter thing until I was thirteen and I've mentioned and retold that story a few times already here. You don't need to hear it again, but it's here if you're unaware of what transpired in May 1986 when I was thirteen. Because my football bone developed late I missed most of Dalglish's playing career, only catching a few brief moments of the man's genius with a football. I've seen enough since to be able to say he was the best player to ever pull on the red shirt of Liverpool and he's up their with greats of all time in terms of how he's regarded. Just a brilliantly skilful, clever and natural player. It was as the manager of Liverpool that I came to admire and love Dalglish. Not just the quiet dignity that he showed post Hillsborough, but that fierce belief in the Liverpool way. Yes, of course there was some arrogance there and he let managers get under his skin at times, but he knew how and when to bite back. My favourite ever example was after a massive game against United. It finished 3-3, I think of we'd have won the title if we'd won and we were 3-1 up at one point. United had a player sent off and naturally Fergie moaned during the press conference. Cue Kenny getting his new born baby and inviting the press to ask it questions as they'd get more sense out of it than they would Ferguson. Brilliant. Of course only three people in the room could understand what he'd said. That thick, almost impenetrable, Glaswegian accent is as much a trade mark as his abilities on the pitch were. He was Liverpool for me and when he resigned a part of the club seemed to go with him. The pressure on him post Hillsborough was just too much, he had a break down and felt it was best for all concerned if he left, but we've never really recovered from it as a club. He was the glue that held all that emotion back, kept us focused on the side instead of the grief and when he went it felt like something infallible wasn't as strong as we all thought. That's in no way a criticism, that was too much for one man to carry. But I think that feeling that the club wasn't as strong as we thought permeated everything and we've never seemed to have the backbone to keep fighting. Apart from that one glorious night of course, when all that I've just said went completely out of the window. We still loved him though, even when he returned to management at Blackburn Rovers. Anfield celebrated like Liverpool had won the title when they won the league there in 1995. His brief spell at Newcastle wasn't filled with success and many will say the man had lost his magic touch. That he was from another era, where he'd been raised by the likes of Bob Paisley. And that is true. But look across to our not so distant neighbours in Manchester United and the same manager that locked horns with Dalglish in 1988 is still in place, still delivering success and you can't help but wonder where we'd be if he'd not left, or just taken some time out. He was the talisman and still is. No long ago, maybe last season or the one before, he was in the Sky studio during a Champions League night. You know, when they sit on those silly stools with a flashy monitor in front of them. I've never seen Richard Keyes so reverential. Ever. Dalglish didn't have a bad word to say about Liverpool, not the side, not the manager, not the American owners. He was hugely respectful of Ferguson and United and all that had been achieved since he'd stepped down at Anfield but there was a glint of envy in his eye. It was a 'what might have been' moment. Personally I would love to see him lead the side out at Old Trafford this Sunday one last time. Not because it would impact the result of an FA Cup tie we have every right to be fearful of, but because for the first time in two years we'd know the side would give everything and play above themselves. That's the Liverpool way, the Dalglish way and we'd be proud of that. 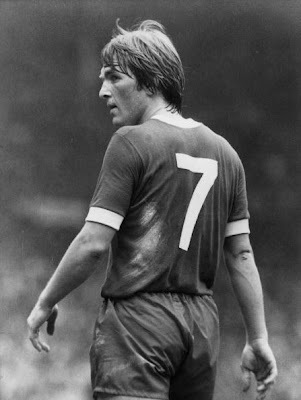 Dalglish isn't just an icon for me, he is The Icon. Whatever happens over the next few days that won't change. I love football because of him. No one outside of my immediate friends or family has been more of an influence.